The “heart language” of the people we serve is American Sign Language. Their common social, educational, and linguistic experiences unite them into a unique culture. We work to equip fellow believers who are themselves native to that culture to share the Gospel. Working with partner ministries and congregations of the Lutheran Church—Missouri Synod, the Lutheran Deaf Mission Society provides training and resources for both Deaf and hearing Christians who bring the saving Gospel of Jesus Christ to people who use visual forms of communication. 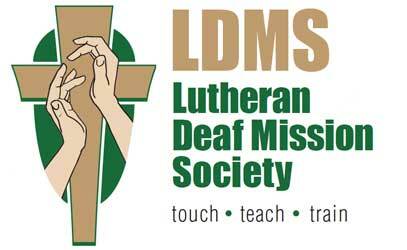 The Lutheran Deaf Mission Society (LDMS) is a Recognized Service Organization (RSO) of the Lutheran Church – Missouri Synod (LCMS). The International Lutheran Deaf Association will meet in Topeka, Kansas July 18 - 21. Find out more . . .
Take these classes online Go to Class . . .